Nebraska football fans had a pretty good idea who would be stars this season for the scarlet and cream. But there are always players who will surprise, putting on performances no one saw coming and helping to make the spectacle thrilling from week to week. This season is no exception, so here are five players who have caused us to sit up and take notice in 2014. Coming into the 2014 season, Randy Gregory was hands-down the player to watch on defense. But, of course, opposing teams knew that, and would shift their coverages accordingly. Then, early in the season opener against Florida Atlantic, Gregory left the game with a re-aggravation of a previous injury. Enter Greg McMullen, previously known as “the other guy” at defensive end. At first out of necessity and then out of performance, McMullen has stepped into his role admirably. He’s piled up 16 total tackles, 3.5 tackles for loss, and 2.5 sacks in his first four games, and has provided an important counter-balance on the defensive line with Gregory’s return. Yeah, Gregory is the star and the NFL prospect on Nebraska’s defensive line. But Nebraska fans have to be pleasantly surprised for the production they are getting from McMullen on the other end. Admit it, you expected to see Pierson-El first on this list. And with good reason, too. While getting a receiving touchdown in game one as a true freshman was a great sign, that was in garbage time of a blowout win over Florida Atlantic. No, Pierson-El’s surprise game in game three, when he was given his shot at punt returns. Nebraska had struggled mightily in that department, having one of the worst punt return units in the nation last year. Pierson-El got put into the rotation as punt returner, though, and things changed. Pierson-El had two returns for an average of seven yards against Florida Atlantic. The following week, his average improved to 10.4 yards per return on five attempts. And then against Fresno State, Pierson-El electrified the fans with a touchdown return, averaging 30 yards per return on five attempts. Coming into the season, one of the biggest questions was how (or if) Nebraska would revive its moribund punt return game. It took a true freshman to answer that question. As the season has gone on, it’s become clear that true freshman Joshua Kalu was going to force his way onto the field. He’s seen time in all four games this season, but his role has gotten bigger and bigger as the non-conference slate wore on. He saw lots of time on the field against pass-happy Fresno State, logging six solo tackles. But it was against Miami that Kalu has made his biggest impact to date. With the Hurricanes driving in an attempt to stay in the game, it was Kalu that made a leaping interception that helped Nebraska pull away and earn an incredibly satisfying win. Yeah, we all know how solid a receiver Westerkamp is, and his catch of the Hail Mary to beat Northwestern will live in Nebraska lore. But this season, we may be getting even more of a handle on how good a receiver he really is. When you watch the games, it’s pretty clear that Westerkamp is quarterback Tommy Armstrong’s go-to receiver in crunch time—sometimes, even to Armstrong’s detriment, forcing the ball to Westerkamp even in tight coverage. But Westerkamp’s hands and route-running prowess make it hard to argue looking for him. And that’s not even discussing the ridiculous behind-the-back catch (pictured above) Westerkamp made against Florida Atlantic. If you say you weren’t surprised by that, you’re lying. As a freshman last year Foltz had an up-and-down campaign as a punter, winding up no. 53 nationally with an average of 41.61 yards per punt. 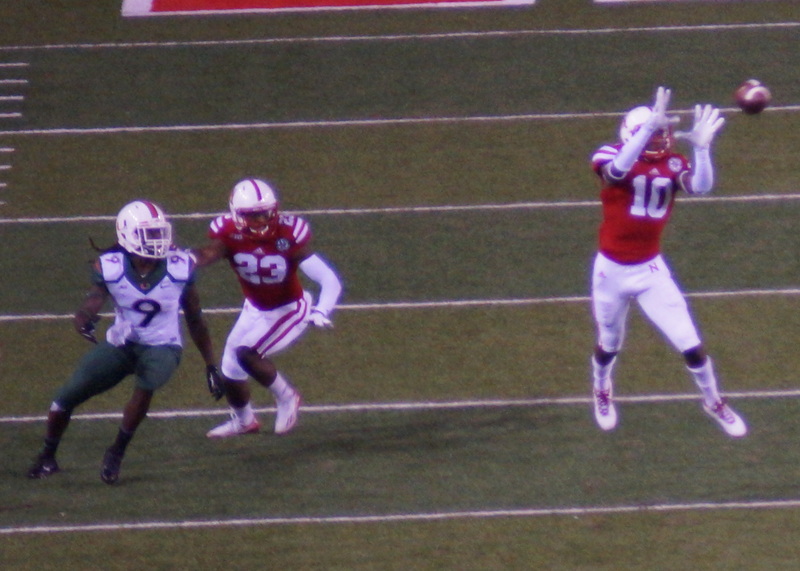 But this year, Foltz has been a crucial (if under-appreciated) weapon helping Nebraska to a 4-0 record. Against McNeese State, with the offense struggling in the second half, Foltz time and again pinned the Cowboys deep, forcing McNeese State to drive the length of the field and keeping the game close. Indeed, if it wasn’t for Ameer Abdullah’s heroics at the end of the game, a strong argument could have been made for Foltz as the contest’s MVP. So spare a thought for the under-valued and under-appreciated punter, who has been an unexpected—and critical—ingredient to Nebraska’s non-conference success.